The origami cone in this tutorial uses 8 1/2-inch x 11-inch paper. You could use plain white copy paper, draw a design on the paper, buy colored construction paper, buy patterned scrapbook paper, or print off the free origami paper design of your choice. Canon Creative Park has a large selection of free printable 8 1/2-inch x 11-inch origami paper. Fold the paper in half horizontally. (If your paper has a pattern on one side, start with the pattern face down.) Crease well, then unfold. Fold the top left and bottom right corners into the middle. When you're finished, your paper should look like the photo. Fold the left side of the paper underneath the right side. Crease well. Fold the bottom right corner up to meet the left vertical edge. When you are finished with this step of the project, your paper should look like the photo. Fold the top right corner down so it meets the left vertical edge of the paper. When you are finished with this step of the project, your paper should look like the photo. Gently open the pocket created at the top to round out the opening of the cone. Congratulations! Your origami cone is complete. 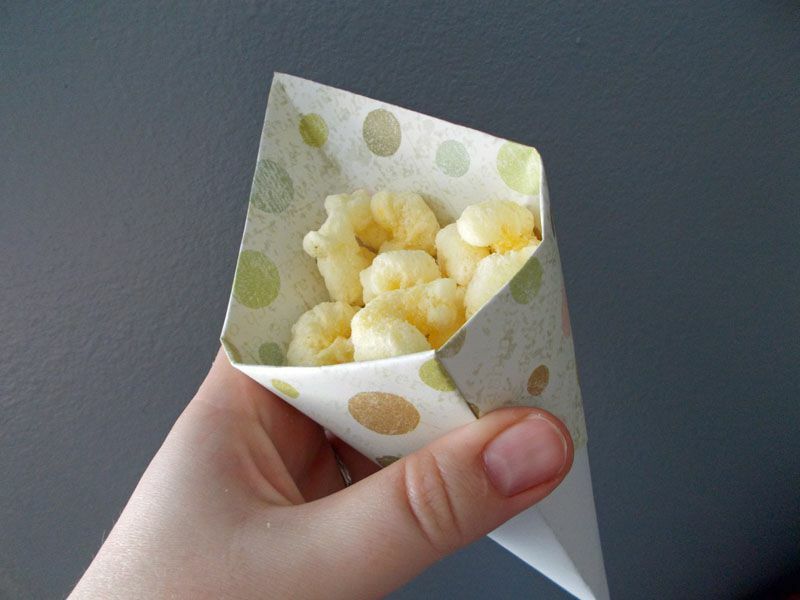 A single cone is good for serving popcorn, chips, party mix, or other snacks at a party. Just avoid using the cone for anything that is wet or extremely greasy, since the paper won't hold up well under these conditions. (If you want to be extremely creative, Home Stories A to Z has a tutorial for a turkey treat holder centerpiece that you could make using these cones. If you tuck the top pointed flap of the cone inside, it makes a fun party hat for a stuffed animal. This would be a cute project to do with children who are learning origami. They can use the hats to pretend they are having a birthday party for their favorite teddy bear. If you want, you can combine several cones to make a fun holiday decoration. The example in the photo to the left uses red and green cones hot glued around an old CD that provides stability for the design while giving you a convenient way to hang the finished project on the wall. An origami medallion folded from two shades of green notepaper accents the center, along with a red snowflake sticker. By using different colored or patterned papers and changing the center embellishment, you could adapt this idea to fit nearly any celebration.